I’m one sentence in and already grammar check is giving me the squiggly green line of shame. This is off to a worse start than usual. Don’t worry, I’m not even going to start off with the almost mandatory numerous paragraphs of semi-relevant blather, which eventually leads to something sort of resembling a segue into the actual point. There’s no time for that. My rage has been building, and I need to just get this off my chest. Why are fruit rolls so damned expensive? I’m not talking about Fruit Roll Ups, which can always be found for a reasonable price. Especially if you get the 48 pack at your local BJs, Costco, Sam’s Club, whatever weirdo warehouse club you go to if it’s not one of those three, etc. Even better is the fact that the 48 pack is usually the Blastin’ Berry Hot Colors flavor, which is the best Fruit Roll Up flavor. Cherry-Orange Wildfire is second. Unfortunately, I can’t sit down with a box of Fruit Roll Ups like I used to. As I continue to mature, my tastes become so refined that the idea of eating an entire box is no longer appetizing. Okay, it is, but I guess now it’s even more blatant that I shouldn’t. So I usually limit myself to six at a time. I have long since been a fan of the classier fruit rolls, but as my palate matures, my desire for a higher end fruit roll increases as well. 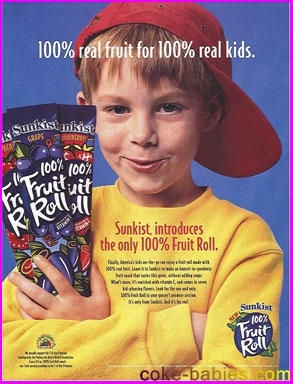 I think my first exposure to fruit rolls was the Sunkist ones. 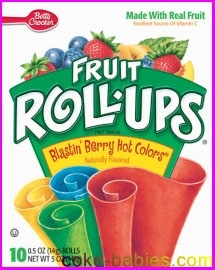 These were the mythical fruit rolls in the supermarket for two reasons: they were amazing, and they were expensive. I don’t know how much they were back then, probably like fifty cents, but that’s a lot when you consider you can either get three of those or an entire box of Fruit Roll Ups. Or if you wanted, you could get the arguably superior Fruit Wrinkles or fruit bars. For the life of me, I can’t remember who made fruit bars. What I remember most about them was they were basically a bar of highly compressed Fun Fruits, and in the ads people would scream when people held up a fruit bar. I’m pretty sure Sunkist made them, since Sunkist made Fun Fruits but… never mind, this is boring. Point being, Sunkist fruit rolls were my first foray into fine compressed-fruit dining. Sunkist rolls seemed to go away around the end of the 90’s. I definitely know that my Waldbaum’s had them back then, but after that I stopped seeing them and haven’t since. Presently, I usually have three options for fruit rolls. The first of these is Joray. These have an extremely tough, plastic-like consistency. And when describing them to people, my go-to description is that they look like fake vomit. Which I know is not the most appetizing description of food. I only use it because it’s pretty accurate. But this appearance and texture is largely responsible for what makes Joray so good. 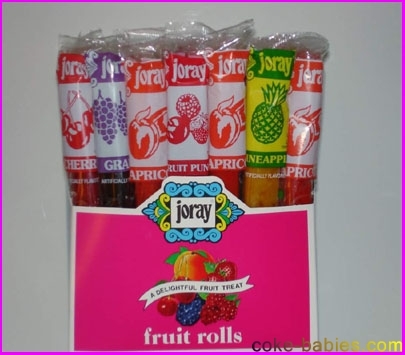 While many fruit rolls will have a chewiness or gumminess, Joray has a vaguely tough texture. Just enough to make you work for the enjoyment. Because they are a little tougher than other fruit rolls, they take slightly longer to eat than the competition. Which is a very good thing for someone like me. If I didn’t have Joray’s texture telling me “Hey, easy there”, I’d plow through the roll in two seconds flat. On the other hand, the texture makes removing the fruit roll from the cellophane very easy. Which doesn’t seem like it would be a bad thing. But with other fruit rolls, the fact that they can prove resilient to removal at least adds a few extra seconds before I can eat them, thereby extending the time of my fruit roll experience. Very rarely do I see Joray in supermarkets, and usually I have to get them in that store in the mall that sells dried apricots and gummy bears in clear plastic bags. This store is almost never in the same location twice, and seems to move into another location in the mall once a month, presumably to where the rent is cheapest. I love looking around these types of stores, but I hate being in them, because I will invariably be the only person in the store. This leads to either them talking to me, or staring at me from behind the register because they think I’m going to steal from them. I think I actually prefer for them to think I’m going to steal, since at least that way I don’t have to talk. These ritzy fruit rolls tend to be a dollar each, or for the special bargain price of five for $4. Now, that may not seem that expensive, but when you consider that I will eat them in the span of about eight seconds, it adds up fast. If I had a gun to my head and was forced to pick a top three, I’d go with Apricot, Grape, and Pineapple. Although being forced to eat only three flavors of fruit rolls isn’t that bad of a punishment, considering the gun and all. The second fruit roll option, probably the closest to the Sunkist ones, is Jovy. The name is similar to Joray, and I don’t know why. I guess in the high stakes world of fruit rolls, you can’t afford to have varying names. Of the three type of fruit rolls here, Jovy are probably the sweetest. Not anywhere near Fruit Roll Up territory, but a nice bit of extra sweetness to straddle the line between “all natural” and “dessert”. One advantage Joray (the fake vomit ones) has over Jovy (the not-fake vomit ones) is the packaging. I appreciate the simplicity, and more important, the lack of a child on the wrapper. I like the message they’re sending: “You don’t have to be a little kid to be eating these. Although you probably should be.” The Jovy rolls retail for about sixty cents where I get them, but that price is probably a good thing. Because if they were much cheaper, I’d probably wind up eating twenty of them a day. Especially the Cherry-Orange. Finally, we have a fruit product that isn’t even a roll… it’s leather. Oohhh, fancy! Stretch Island’s fruit leather might be the best of the three, but have the disadvantage of probably being the most expensive. They’re similar in price to Joray (fake vomit), but are like half the size. Which makes matters worse, since these are harder to budget bites from, I usually just eat the whole thing in two bites. Ah, but the few bites you get are fantastic. The texture of Stretch Island makes them the Two Face of the fruit snack world. One side is smooth, and a little bit sticky. So whilst eating them, you must be careful to clean your hands in the most dignified way possible (licking your fingers), otherwise your keyboard or anything else you touch immediately after will become like something akin to fly paper. The second, evil side of Stretch Island is the dry side. This side seems much tougher, dryer, and has a somewhat rough texture. In an effort to make the fruit leathers last longer, I’ll often leave a bite in my mouth, using my tongue to rub the rough part of the fruit leather against the roof of my mouth. I don’t know why I do this, because it almost invariably leads to my mouth getting irritated. Now I realize that describing a snack as being like fly paper and possibly hurting your mouth doesn’t sound like a great sales pitch. This is probably because I would be a terrible pitch man. I don’t think that description of the products would have people rushing to my booth at the international sugar expo. Unrelated, but I’ve always wanted to go to one of those candy/snack expos. I always see them on The Food Network or The Travel Channel, and they just look amazing. Unfortunately, my credentials of “writing for an infrequently updated web site that I don’t think anyone even read, even though I often write about snacks” just hasn’t been enticing enough to inspire anyone to offer me an invite. Phew! Back to Stretch Island. They were one of the companies that made me realize that cherry can actually be a good flavor. As I’m sure you remember, I have mentioned my dislike for cherry in the past. Cherry Starbursts are vile. A while back, my wife got me a big box of these as part of my birthday present. I’m easy to shop for. But the box was a multi-pack, including cherry, which I was saddened about, chalking it up to a flavor I’d wind up giving away. I figured I should try at least one, and lo and behold, it was awesome. It was a cherry much more reminiscent of the old fruit bars from the 80’s. I was impressed. It didn’t have that gross, cough syrup cherry flavor that a lot of cherry snacks have. Making that multi-pack last longer than a week was the result of some of the most restraint I think I have ever demonstrated in my life. Fruit leather even made an appearance in a recent episode of The Office, which is becoming quite the taste maker in food trends. For further proof, see my old report on their support of Cup Noodles. In the episode, Michael has a disparaging remark for the apricot flavor, which is foolish since apricot is certainly the best fruit leather flavor. But any support of fruit leather in general is cool in my book (which would be a book with a lot of pictures). So it appears I didn’t really get to the heart of the matter: the unfortunate prices for fruit rolls. Also, I’m starting to think maybe they aren’t that expensive. When you spend all this time talking about how awesome something is, I guess you see their value a bit more. Oh well. I guess I’m like one of those charities that just raises “awareness” of an issue. Feel free to donate.